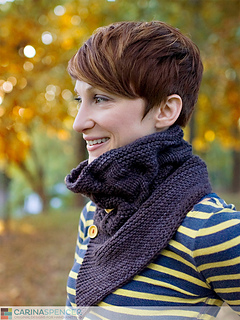 A cozy, button-up cowl with alternating columns of garter stitch cables and stockinette featuring a short row wedge that hangs like a kerchief for extra coverage. 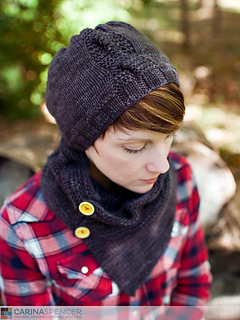 Check out my Garter Cable Hat for a coordinating set. 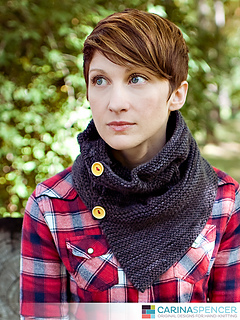 Purchase both Garter Cable patterns and receive a $2 discount! No code needed and purchases do not have to be made at the same time, the discount will be automatically applied any time the second pattern in the set is purchased. Pattern is written for one size to fit the average adult. Measurements are taken post-blocking. 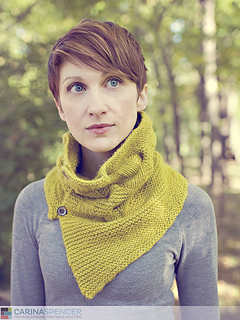 YARN: Approximately 260 yards of worsted or aran weight yarn. Yarn shown in photos is Malabrigo Twist in Pearl Ten (grey) and Manzanilla Olive (green). 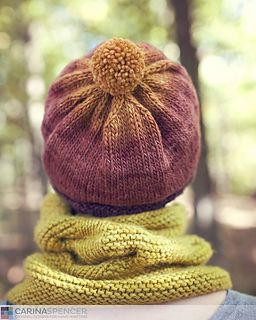 The ombré hat is Freia Worsted in Maple and was knit to a slightly smaller gauge than called for in the pattern. NEEDLES: 16” (or longer) circular needle in US size 8 (5mm) or size required to obtain gauge. NOTIONS: 4 buttons about ¾” in diameter, a darning needle.